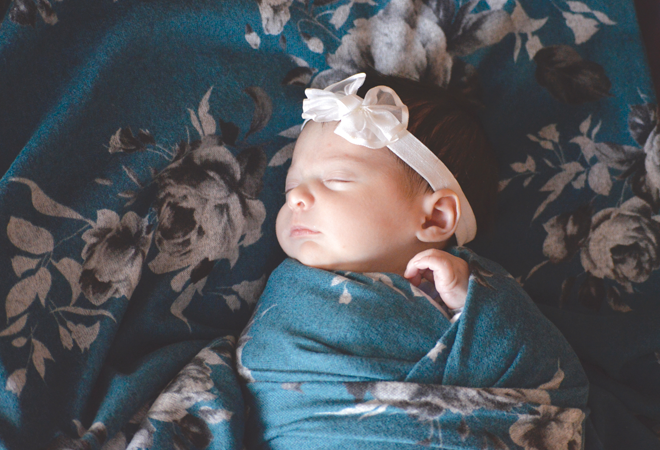 BIRTH ANNOUNCEMENT: Lucas and Logan Gerlock welcomed their third child, Beatrice Joyce, into the world on January 19, 2019. Are you looking for some fun activities for your kids over February Break? 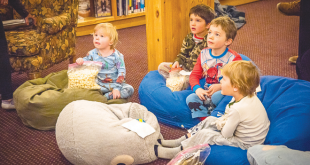 The CBCS Community Workshops is offering a program Tuesday – Friday, February 19 to 22 from 8:30 to 3:30 at the CBCS for students in kindergarten through 6th grade. Join us for fun science experiments, art projects, cooking, games in the gym, Legos, puzzles and more Tuesday. Sign up for as many days as you’d like. It is $40/child/day and scholarships are available. Register at: https://bit.ly/2Tg1WF6 and pay with mypaymentsplus. Questions? Contact Jill van Tiel at jillvtiel@gmail.com. This week at the Center kicks of with two artistic opportunities in two different mediums. Creative Writing Taster Series – Environmental Writing explores techniques of the greats and exercises to improve your own power of persuasion (Thursday, February 7). If getting dirty is more your thing, grab a friend and join the clay-making Mud Wrestling class (Thursday, February 7). The multi-day Pastel Paining Series experiments with different techniques to make a three -part series (Monday, February 11), while Art for Ages 11 – 14 has blooming artists honing their skills in acrylic painting (Tuesday, February 12). And if you just can’t wait to get started on Valentine’s Day – Scorn Not the Sonnet (Tuesday, February 12) helps you craft your own lofty love poems while Couples Class: Aphrodisiac Cooking cranks the heat stirring up a three-course dinner (Wednesday, February 13). Finish it all visiting strolling Arden Saunders’ Opening Reception at the Piper Gallery (Wednesday, February 13). The Crested Butte School of Dance has their winter performances this week. The school’s dancers age 12 to adult shine their incredible technique and talents in lyrical, hip-hop, aerial, tap and contemporary…. all to the Rolling Stones, Jimi Hendrix, Floyd, the Beatles and more. Come rock out with them Thursday through Saturday, February 7-9 at 7 p.m. at the CB Center for the Arts. Get advance tickets at dancecrestedbutte.org. Mark your calendars as the Crested Butte Film Festival presents three nights of Oscar-nominated short films, Friday through Sunday, February 15-17 at the Center for the Arts. The programs are divided into three genres with documentary short films kicking off the series on Friday, February 15. Live action (or scripted and acted films) will follow on Saturday, February 16. Showtimes for each are 7 p.m. The following afternoon at 2 p.m., animated films will complete the program. Tickets for each show are $12 and are available at cbfilmfest.org, at the Center for the Arts, and at the door. The Inaugural Murder in the Mountains Mini Noir Festival darkens the halls of the Center for the Arts Friday, February 22 and Saturday, February 23. This promises to be a thrilling weekend celebrating all things murder and mystery writing, including author conversations, a live panel exchange with Scottish crime writers, a mystery writing workshop, a youth forensic workshop, a “Noir in the Bar” event, and more. Tickets may be purchased to individual events (some with student discounts) or purchase a Festival Pass for $100. 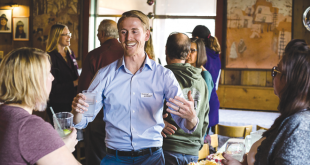 The Full Festival pass includes entry to all events including Pinot & Noir writing workshop and Murder Mystery Dinner; books signed by visiting writers; and discounts at select local businesses. 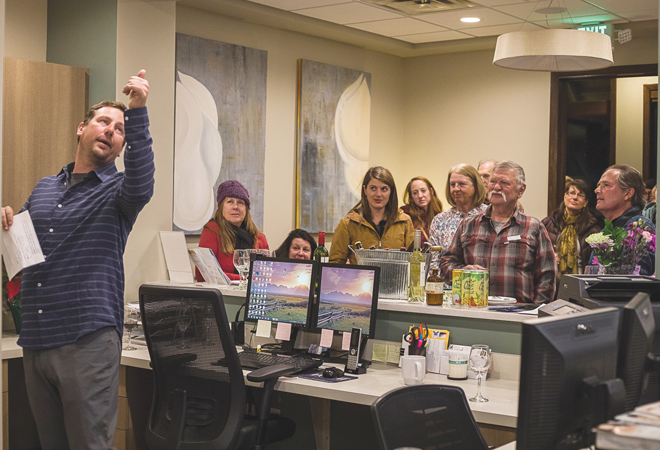 AFTER HOURS: The Crested Butte Land Trust, Creative Catering, Frank’s Deli, and Integrative Dentistry co-hosted a Chamber Business After Hours event on Tuesday, January 22. 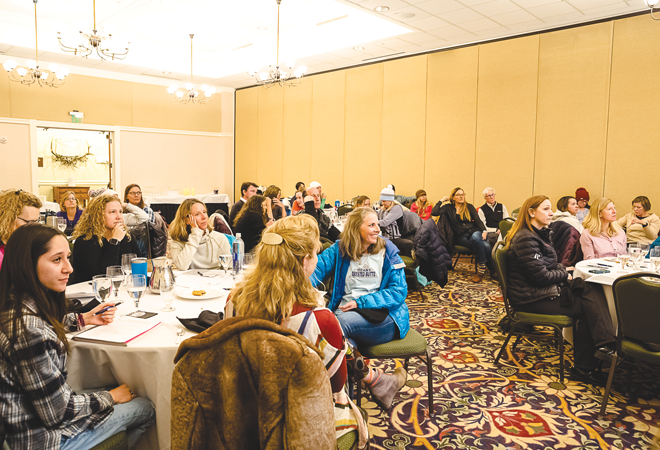 VAPE DINNER: A GCSAPP educational dinner, focused on talking to students about marijuana culture, was held at the Lodge at Mountaineer Square on Tuesday, January 29. 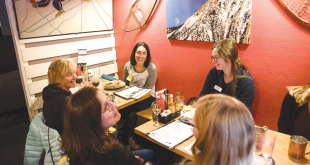 Cameos: What would you do if the streets of Crested Butte were always groomed with snow?